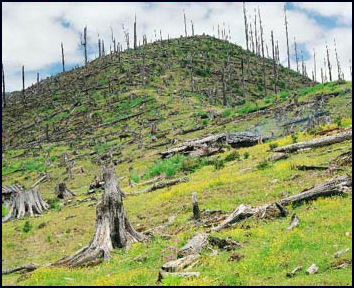 Deforestation in Yunnan Currently around 14 percent of China is covered by forests. Most of these are in the northern, southern and mountainous central parts of the country. There are some tropical rain forests in Yunnan Province in southern China and in other provinces along the southern coast. Illegal logging and slash and burn agriculture consume up to 5,000 square kilometers of virgin forest every year. In northern and central China forest cover has been reduced by half in the last two decades. The mountains in southwest China have suffered serious deforestation, logging, hunting and collection of plants and animals for traditional medicines. The last remaining large stands of forest are in northeast Manchuria. Even these are being cut down at an alarming rate to be "made into chopsticks, toothpicks and Ping Pong paddles." Most of China's rain forests along southern coast are threatened although a few areas are protected. The furniture industry in China gobbles up large amounts of Chinese timber as well as illegally-logged tropical rain forest timber from Indonesia and other places. The use of disposable chopsticks uses up 1.3 million cubic meters of timber a year according to China’s environment ministry. Between the mid 1990s and mid 2000s China went from being a country that imported much of its wood products to one of the world’s leading exporters of furniture, plywood and flooring. China is also a leading consumer of paper. While many paper products are made with recycled paper China still has built a number of new pulp mills and in the future they will need trees to keep them going. Chinese demand for wood is consuming foorests around the globe. The rain forest of the Congo and Cameroon in central Africa, the Amazon basin and the islands of Indonesia are all being heavily logged to supply China’s growing demand for wood and its rapidly-growing furniture industry. More deforestation in Yunnan Clear cutting and overgrazing have turned large areas of Qinghai province into a desert. Large tracts of forest also being cut down in Sichuan and Shaanxi provinces have threatened the home of the giant panda. In the 1980s and early 1990s, the Chinese logged the forested areas of Tibet very intensively. The film Cutting Down Tibet, made secretly by a Tibetan, shows huge logging camps in southern Tibet and trucks loaded with trees10 feet in diameter. Deforestation has turned once clear streams muddy brown. An increase in the number of livestock animals and a rising demand for fuel is threatening to strip the valleys of vegetation. Run-off from denuded mountain slopes is believed to have been a factor in excessive flooding of the Yangtze River in 1998. Deforestation has been slowed since the 1998 Yangtze flood. Logging has been banned in Omda, Markam and Gonjo counties in Tibet in part to prevent erosion from filling in the Three Gorges Dam reservoir on the Yangtze. 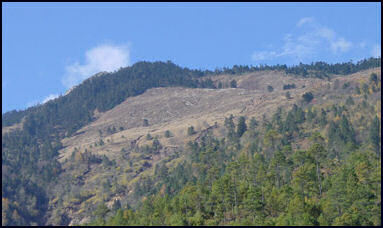 Large reforestation projects are being carried out. China has banned logging in natural forests, earmarked $10 billion for reforestation projects and plans to spend $1 billion a year over 30 year to expand protected areas. To reduce consumption of wood China has imposed a five percent tax on wooden flooring and even chopsticks. The Min River valley, near panda habitats in Sichuan, is focus of ant-logging efforts. Lumber jacks are being trained as tree planters, logging is banned in some areas of Sichuan and Hubei provinces. China is engaged in a massive tree planting program too revitalize its forests and timber industry, conserve its soil and halt deforestation and reduce its reliance on imported timber.The government has planted millions of trees since the 1970s and turned large swaths of for formally barren land into forests. The effort was undertaken mainly to control floods and erosion but also has the added effect of combating global warming by soaking up nearly half a billion ton of carbon dioxide a year. On the basis or reducing carbon emissions, huge tree planting efforts in China have offset deforestation in Brazil and Indonesia. In Asia, the tree planting program in China more than offset deforestation in other parts of Asia to produce a net increase in the amount of forested land in the Asia-Pacific region between 2000 and 2005. A study published in 2006 in the U.S. journal Proceedings of the National Academy of Sciences found many of the world’s forests are making a comeback and some are more thickly forested now than they were 200 years ago. The great gains have occurred in China, Ukraine, Spain, Vietnam and the United States while the greatest losses have occurred in Brazil, Indonesia, Nigeria and the Philippines. A 4,500 kilometers long Green Belt has been created in northern China with 35 billion trees.The planting in the north has been done in one-mile wide strips and the survival rate of the millions of acres reforested has been 70 percent. Another belt of trees has been planted in southwest China as a protective measure against typhoons. Through its tree planting scheme China hopes to boost its forest cover to 20 percent by 2010. 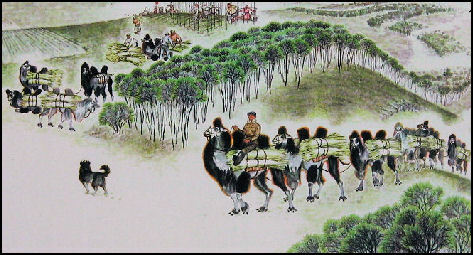 Tree-planting is considered a civic duty that must be performed by every person in China. The amount of land covered by forest in China has increased from 9 percent in 1949 to around 13 percent today. After the Yangtze floods in 1998, a logging ban was imposed in natural growth forests and massive reforestation project was launched on the Yangtze watershed. Terraces on slopes steeper than 25 degrees are to be planted with grasses, bushes and trees. Huge tracts of farmlands are to be converted back to wetlands, pastures, forests and lakes. Some of the reforestation work is done by sapling hole diggers who, for a days work, are “paid four or five packets of instant noodles which they consume dry because no water is available. In some cases holes are dug and terraces are built but no saplings are planted. When asked why one villager told the Los Angeles Times, “Because our labor is free, but they’d have to pay for the trees. The local officials embezzle the money instead.” When saplings are planted is when a Beijing VIP or television crew shows up. Logging, overgrazing and poor land use cause erosion which in turn causes lakes and rivers to silt up, arable land to be eaten away, and flooding to increase because vegetation that catches rainwater and slows its flow into rivers is gone. Soil erosion is common on China's crop land that is not irrigated. The Yellow River--which drains much of Northern China-- derives its name from the 1.6 billion tons of eroded, ocher-colored topsoil that it annually transports to the ocean. 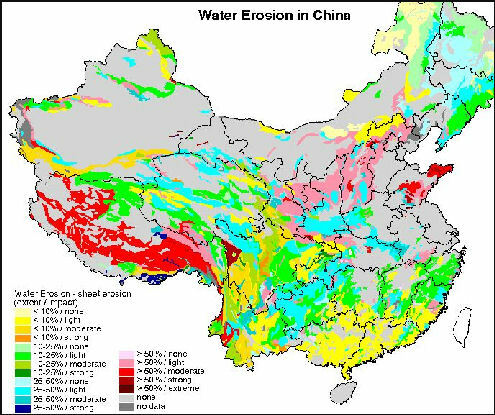 Waterlogging and salinization affect 23 percent of the irrigated land in China and significantly reduce production on an estimated 15 percent of China's irrigated land. An estimated 6 million acres of land has been damaged by salt. About 28 percent of China is covered by desert and that amount of desert in China is getting larger every year. Deserts are being created faster in China than anywhere else in the world, with old deserts expanding and new deserts being formed. The rate of desertification nationwide is around 900 square miles a year, an area nearly the size of Rhode Island, with an area the size of New Jersey becoming desert every five years. The situation is improving though . About 3,400 square kilometers per year was lost in the 1990s. The rate slowed to 1,300 square kilometers per year in the 2002. In western China the huge Taklimakan and Kumtag deserts are expanding at such a high rate they are expected to merge in the not too distant future. Two deserts in Inner Mongolia and Gansu Province are also in the process of reaching each other and merging. The Gobi grew by 52,400 square kilometers (20,000 square miles), an area half the size of Pennsylvania, between 1994 and 1999, and continues to advance at a rate of two miles a year and is now only 240 kilometers or so from Beijing. The Chengdu plain, one of China’s primary grain-growing areas, is threatened by sands from the Ruoergai grasslands. The grasslands were a rich grazing areas until a few decades ago when cows and goats began to multiply and overgraze the land. There is danger that a dust bowl situation could develop. Already wells have dried up and emergency grain supplies have to be brought in to keep people from starving. Many people are being encouraged to move to more hospitable lands. The grassland has been likened to the thin skin on a bun. It can be destroyed if a couple of centimeters is disturbed. One Mongolian said, “Our leaders used to say we should never cultivate the grassland.” Greenpeace argues that grass seeding and stricter land management are the best way to reclaim the land. The main causes of desertification are overgrazing, overplanting , overplowing and raising crops in regions too dry for crops. These problems in turn are result of population pressures on marginal land. The problem is somewhat analogous to what happens in areas that have been deforested. Once an area is degraded people move onto a new area and degrade that while the old area takes decades to recover or never does. Dr. Sing Yuqin of Beijing University told the New York Times, "Once the process gets started it tends to expand exponentially. And the people are pushed into a poverty trap from which it's hard to escape." One of the main culprits of the desertification in the Mao era was Mao's plan to raise grain in areas where grain didn't grow well, such as Inner Mongolia. This deprived the land of grass which prevented soil being blown away by the fierce winds that ravage this region. 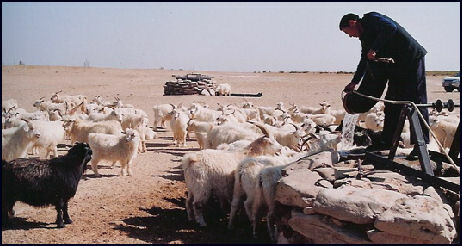 Some believe that desertification has been caused by climate changes. Scientist in Qinghai have recorded higher temperatures, lower rainfall and stronger winds since the 1950s. Persistent drought robs the soil of moisture and makes it easer for the soil to be picked up and carried away by wind. In Inner Mongolia, global warming appears to have made the region drier. Desertification in China is caused largely by overgrazing. Huge flocks of sheep and goats strip the land of vegetation. In Xillinggol Prefecture in Inner Mongolia, for example, the livestock population increased from 2 million in 1977 to 18 million in 2000, turning one third of the grassland area to desert. Unless something is done the entire prefecture could be uninhabitable by 2020. To combat desertification, the government has encouraged the planting of drought-resistant trees in erosion-prone areas and helped people to obtain technology that helps them collect and store rainwater. In some places farmers are paid to plant trees rather than raise crops. Pines and poplars provide shields from encroaching dunes. On the Loess Plateau erosion has been reduced, with funding from the World Bank, by terracing the landscape. In what has been described as the world's most ambitious reforestation project, the Chinese are planting a line of trees and shrubs, paralleling the Great Wall of China, to protect farmland in northern China from Gobi Desert sand blown by the fierce Mongolian winds. Stretching from Xinjiang to Heolongjang, this "Green Wall" will eventually cover strip of land 4,000 miles in length. Using a technique introduced by the Soviets in 1962, the Chinese have made progress slowing down sand dune migration by putting plants inside "small checkerboards" made of straw bales to protect the plants long enough for them to take hold permanently while stabilizing the dunes and stopping sand from blowing. Arranged roughly in one-meter square checkerboards, the grids are pressed into the sand so that the stalks stand four to six inches above the ground. This creates enough of a windbreak to slow surface sand movement so the plants can establish themselves The technique was devised to keep sand from blowing across railroad tracks---at one time a serious problem that blocked tracks and slowed commerce and passenger service. In places where overgrazing is a problem fences have been put up and herders have been given plots of land to encourage them to take good care of the land. To reduce the number of animals the government is encouraging herders to cut the size of their flocks by 40 percent, relocate and stall-feed their animals. But herders are not so keen on these ideas. Animals have traditionally been a source of wealth and a kind of insurance for hard times. The Institute of Desert Research in Shapotou, a town on the Yellow River, is facility that is devoted to solving problems related to desertification. Spread out over one square mile, it employs 19 full time researchers who conduct experiments with drought-resistant crops; desert agriculture techniques; the use of plants, shrubs and grasses to stabilize dunes; petroleum-based dune stabilizing sprays; and Israeli-style drip irrigation. Some towns in Inner Mongolia have built clay walls to keep sand and dust out. But even that hasn’t proved to enough as sand has come in and engulfed houses, marginalized agriculture and forced people to move. Beijing insists its efforts are paying off, and says that China’s deserts are shrinking at a rate of 1,200 square kilometers a years, compared to increasing a rate of 3,500 square kilometers in the late 1990s. No everyone accepts these figures. The Loess Plateau is a region in northern China about the size of France, Belgium and the Netherlands combined. Loess is nothing more than compacted dust and silt. In the case of Loess Plateau it originated in the deserts to the west and was carried to central China by strong westerly winds for hundreds of thousands of years. In some places the loess is hundreds of meters thick. Erosion is a serious problems. Rains and winds carry the loess into the Yellow River and the air. “The Loess Plateau is one of the places Chinese civilization began. A visitor to China’s Loess Plateau would rightly be puzzled that the region was once the cradle of Chinese civilization,”Paul Mozur wrote in the New York Times. “Through thousands of years of farming, much of the once fertile soil has been leached to the point of infertility. Massive dust storms pick up the loose soil and carry it as far as Tokyo and Taipei. During sunset, fumes from factories block out the sun well before it can be observed sinking below the horizon. Many tree planting efforts in the Loess Plateau region have failed. In recent years entire hillsides have been covered with sink-wide, hand-formed basins made to held a single sapling and water so its survive and create a platform to prevent it from eroding away. “The result of careful terracing, replanting of native vegetation and restrictions on grazing, the rejuvenated land now supports a thriving local agricultural economy. Even better, the new vegetation reduces flooding and dust storms by anchoring the region’s soil and is becoming a large carbon sink. A 2009 film directed and written by John Liu, the founder of the Environmental Education Media Project and a veteran eco-film director, tell the story of the Loess Plateau. The documentary, Hope in a Changing Climate , takes the story of the Loess Plateau as its lead, but quickly moves to Rwanda and Ethiopia where similar successes have come from a process known as forest landscape restoration, which hold great promise globally for combating deforestation, desertification and global warming. Desertification is causing millions of rural Chinese to abandon unproductive land in Gansu, Inner Mongolia and Ningxia Provinces and migrate eastward. A study by the Asian Development Bank found 4,000 villages at risk of being swallowed up by drifting sand. Already a migration on the scale of the Dust Bowl in the United States in the 1930 is taking place in China. The only problem is that in China there is no California to escape to. Many of those driven off land degreded by desertification have ended up in eastern cities as migrant workers. In parts of the Ningxia Province, significant rain has not fallen for years and farming is impossible. Tens of thousands of people from villages mostly in poor southern Ningxia have been resettled to 215,000 acres of newly irrigated land near the Yellow River in north central China. The exodus took place between 1998 and 2000 and cost about $325 million. About 70 percent of those affected are Huis. Planners had originally hoped to resettle a million people (20 percent of Ningxia's total population) but there was enough money available to handle that many people. The problem is most severe in the north-west, where desert sands are swallowing up farmland, homes and towns. One place known as an “ecological disaster area” is Mingqin, a shrinking oasis area In Gansu Province. Here the Yellow River has been diverted more than 100 kilometers to replenish dried-up reservoirs and aquifers in Minqin, where the population has swollen from 860,000 to 2.3 million over the last 60 years, even as water supplies have declined. On top of that the Tengger desert is encroaching from the south-east and the Badain Jaran desert from the north-west. Since 1950 the oasis has shrunk by 111 square miles (288 sq km), while the number of annual superdust storms has increased more than fourfold. In Liangzhou district, 240 of the 291 springs have dried up. Global warming is adding to the problem. Evaporation rates are rising, along with temperatures. According to a study by the Center for Agricultural Water Research in China, 64 percent of the reduced stream-flow in the area is attributable to climate variation. One person that lives in Mingqin is a man named Huang Cuikin. Huang told The Guardian dust storms hit his village more often than in the past. The water table is falling. Temperatures rise year by year. Yet Huang says this is an improvement. In 2006 he was relocated here by the government from an area where the river ran dry and the well became so salinated that people who drank from it fell sick. Huang is one of thousand who the government has paid to move from the worst affected areas.”Life is easier now,” Huang told The Guardian, puffing on a cigarette in the new brick home that the authorities have given him. “When we lived in Donghuzhen, we had little water and the crops couldn't grow. Our income was tiny and we were very poor.” The government has given him a new home and land, but the desert winds still howl outside the door and his fields are bordered by sand dunes. Workers in the fields wear masks to protect their faces from the dust storms that whip in from the dunes. Farming is no piece of cake either. When the desert winds tear up the sands outside his front door, says he is choked by dust, visibility falls to a few meters and the crops are ruined. “We have taken every measure we can think of to stop the desert moving closer and submerging our crops and villages,” he said. Bu Xing'ai, director of external affairs for Ningxia, said authorities planned to move 350,000 people within the autonomous region over the next five years as he showed off the project to journalists on a recent visit. China's breakneck economic growth has been accompanied by huge population movements, as exemplified by Ningxia, where new towns have been quickly built, sometimes at the heart of semi-arid zones. For the government, planned migration is a way of channelling the inevitable rural exodus and redistributing the labour supply to suit the country's needs. Authorities in Ningxia say those who move under the scheme will have a better quality of life than they do at present.A cement factory with the capacity to produce 4,500 tonnes of cement a day is being built to provide employment for the migrants. "Once they are here they will find roads, electricity, water, they will be able to find work at the factory and their children will be able to go to school," said Wu Guangning, deputy director for development and reform in Ningxia's Yongning county. Many of the intended residents are Hui, a Muslim minority that has lived in the autonomous region of Ningxia for centuries. The local climate is dry, but the authorities have planned an irrigation scheme that would allow residents to grow grapes, mushrooms and goji berries -- a highly nutritious fruit that is popular in the area. It is not entirely clear why the scheme has been labelled "green". The roofs of the houses are to be fitted with solar panels, but they are not yet visible. Each house will cost 40,000 yuan ($6,275), but of that, the local government provided 30,000 yuan, said Wu. Asked about the practicalities of getting mountain people to move to the desert, Wu said they were being encouraged to come and see the new settlement and decide whether they are "satisfied" with it. "They are currently living in very difficult conditions," he added. With no one yet living in the new houses, and their proposed occupants living many hours' drive away, it was not clear how their satisfaction with the new housing might be gauged.So, the organisers of the trip took the journalists by bus to see a migrant who had agreed to be interviewed in his tiny home, where baskets of fruit had been laid out.Ma Guowen was dressed in a Muslim skull-cap and wearing his best jacket for the occasion. But the farm worker's comments on the benefits of the government rehousing scheme seem a little too pat to be convincing. As a youth, Wang witnessed the ravages of desertification, from lost cultures to families forced to flee and houses buried -- events that have affected him deeply. "At the beginning, the situation we faced was very difficult. We did not have the money to fight the sands. We even had to go to the town to find financing," says Wang, whose face is deeply tanned after decades of working in the open ai. Along with his relatives -- who, like him, are members of China's Hui Muslim minority -- Wang launched himself into a Sisyphean battle to try to "fix" the dunes of the Maowusu. His method of using straw to fence off plants and protect them is simple, but labour intensive. The Baijitan cooperative employs around 450 workers who live on site, two thirds of them Muslims. "Each worker has an annual target of digging 10,000 holes, sowing 10,000 plants and makes 10,000 yuan ($1,567)," says Wang. Using water taken from the region's very deep water table, they are achieving miracles. The director shows off the fruits of his project -- orchards, planted in a sandy valley, that produce juicy apples. All around, the sand dunes are chequered with squares of green as bit by bit the vegetation takes over. Wang says the planting has slowed the winds carrying the sand by 50 percent. The Baijitan reserve covers 1,480,000 mu -- a Chinese measure equivalent to around 100,000 hectares. It contains a "green belt" 10 kilometres (six miles) wide and 42 kilometres long intended to contain the advance of the dunes. The land belongs to the state, but the government only puts up around one fifth of the financing with the rest coming from the sale of farm produce, including apples and peaches. Chinese leaders including President Hu Jintao and Vice-President Xi Jinping have travelled to Baijitan to hail it as a "model" project. Wang is a classic example of the heroes that China's Communist leaders are trying to promote, and who also include Yang Liwei, the first Chinese man in space, and Yuan Longping, inventor of a hybrid rice. The "warrior of the sands", as he is known, was even one of the torch carriers at the 2008 Beijing Olympics. But his success belies the harsh realities elsewhere in China, where experts say the desert is gaining at a rate of several thousand square kilometres a year. Desert already makes up more than a quarter of the country. Agro-economist Lester Brown says that around 24,000 villages in China's north-west have been totally or partially abandoned since 1950. "China is now at war. It is not invading armies that are claiming its territory, but expanding deserts," he wrote recently. "Old deserts are advancing and new ones are forming like guerrilla forces striking unexpectedly, forcing Beijing to fight on several fronts. And in this war with the deserts, China is losing." Nonetheless, China's limited success in the fight against desertification has become a global reference point, and foreign experts and political leaders are flocking to Baijitan to see the project. Hussein Hawamdeh of the University of Jordan is one. He told AFP in Ningxia that China's experience had been useful in his country's Badia region, a major farming area that is under threat from rapid desertification.